What would you do if your dog ruptured their cranial cruciate and couldn’t have surgery? This is something we deal with every day at Dogs In Motion. We get regular email enquiries and pets coming to see us, with an injured or ruptured cranial cruciate ligament, and for a variety of different reasons these patients are not surgical candidates. In the past, we would try to manage these patients, in conjunction with veterinary management, with rehabilitation including attempts to strengthen and stabilize the knee joint. If you read our page on cranial cruciate ligament problems you will see that often biomechanics and the disease process are working against us. Conservative management of these patients is not often successful. But since working with OrthoPets we have been able to offer custom stifle braces to these patients, to stabilize the stifle joint and allow them to live a more normal life. A custom OrthoPets stifle brace is made specifically for each individual patient, and prevents cranial tibial thrust and rotational instability, making the stifle stable and comfortable. Once a custom stifle brace is fitted, therapies become more effective. Anti-inflammatories can control pain swelling and inflammation as instability is eliminated. Strengthening exercises and hydrotherapy can now be effective and muscle can grow, lameness reduces and exercise tolerance increases. These devices are really well tolerated by the patients too! Don’t live nearby to Dogs In Motion? Don’t worry! 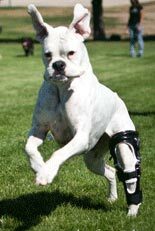 We can send all the relevant instructions and details to your pet’s vet, so they can help you and your pet get a perfect cast impression of the limb, and later fit your pet’s device and guide you through rehabilitation. Tags: Animal Physiotherapy, Animal rehabilitation, cranial cruciate ligament | Permalink.